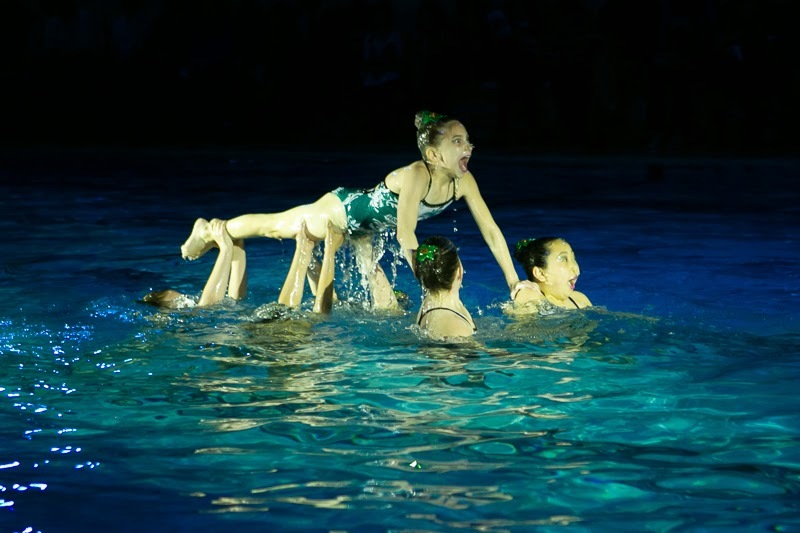 Home » ANA Synchro Blog » Leah's Blog » Annual ANA Synchro Show – A Lot of Work, but a Lot of Reward! Annual ANA Synchro Show – A Lot of Work, but a Lot of Reward! Smiles are bigger and energy is higher when performing for friends & family at the annual ANA Synchro show! Last month, ANA Synchro hosted its annual show at the Andover/North Andover Y. We are thrilled to announce that this year’s production, Defying Gravity, surpassed last year’s box office record and introduced synchronized swimming to many new fans in the community! Putting on three performances like we do is a huge, annual, undertaking. Is it worth it? The coaches could have easily just worked with the athletes to prepare for the next competition. The volunteers surely could have found other things to do with their time! And the Y could have experienced just another calm weekend pool schedule. ANA Synchro athletes develop close bonds by swimming all together at the annual show. Maxie Zimmerman, Athlete, Senior Team: The show is a very fun event for the girls. We all put a lot of work into the show, but it definitely pays off when show time comes around and we get to show off our routines and how great a sport synchro is! I think we all love the show so much because it is the one time of year when we get to swim with not only our team of 8 people, but with all of our ANA sisters! It brings all of us so much closer as a team! Audiences, and especially the athletes, enjoyed seeing five coaches perform an exhibition swim. They still have it! Leah Pinette, Head Coach (and someone who has been in her share of shows over the years! ): The show is a very fun event for the girls. They’re performing just because they love the sport and want to share it with the community. And it actually really helps us for competition because it closely simulates a competition environment – much more so than we’re able to achieve in an ordinary practice. Even without the scoring pressure, the athletes will still get nervous because they want to do well in front of their friends and family. The show gives them an important chance to learn how to control those nerves. It definitely helps them bond so that when they do go to compete, they are a stronger team. Not all that coincidentally, our Age Group athletes had an important qualifying meet the very next weekend after the show, and I’m happy to say all of them moved forward to the next round, on their way to Age Group Nationals later this summer. The show was a nice warm-up for that. Novice athletes get ready to show their stuff in their first ANA Synchro show! Ken and Marsha Cordio, first-year parents of a novice athlete: We thought that the show was a great way to end the season for the novices, with an event that was very entertaining for all demographics. Our daughter really enjoyed the opportunity to perform for her family and friends. The show really educated our extended family about the sport, but in a thoroughly entertaining way. We were so proud of and impressed with what the novice team could do! ANA Synchro teaches teamwork and other important life skills - all in a fun, youth development-oriented environment! Maureen M., Long-time Parent: I saw my first show 9 years ago. It really shows the heart of the Y people and how their programs shape and transform the lives of the people who are involved in them. Synchronized swimming has taught our daughters more than how to be great athletes. It has taught them so many life lessons about friendship, family, hard work, disappointment, conflict resolutions just to name a few. It has been a vital part in making them into the strong, confident, healthy, happy, productive individuals that they are. I am so grateful for all the Y has done for our family. I see the show as a way the swimmers and families can give back to the Y and show what a wonderful program we have and get others involved in the Y's programs. ANA Synchro athletes develop confidence at the Y! Alex Turek, Executive Director of the Andover/North Andover Y: There are a few reasons the show is so important to the Y. First, it is a great way to bring people into the branch that may never have been here before or know what we have to offer. Second, we see the rich tradition associated with the show and with Marilyn Fitzgerald starting the team so long ago. What a great way to honor our early beginnings in the sport! But more than either of those, is the opportunity for the girls to showcase their talents in front of a crowd. There is nothing like performing in public to boost one’s self-confidence and build character. That’s what we are all about! Girls as young as 6 years old can join ANA Synchro! Check our website for the next "Learn to Synch" class! Kate D’Ambrosio, Aquatics Director (and former synchronized swimmer herself! ): I think it’s so important for us to put on our annual Synchro show. First, it’s a great way to get more information out there about what exactly synchronized swimming is and how difficult a sport it is! Second, it’s a great way for the girls to showcase all their hard work for family and friends. Third, it also shows young girls some of the different opportunities there are after swim lessons. So many kids track towards swim team because they don’t realize that there is another option. 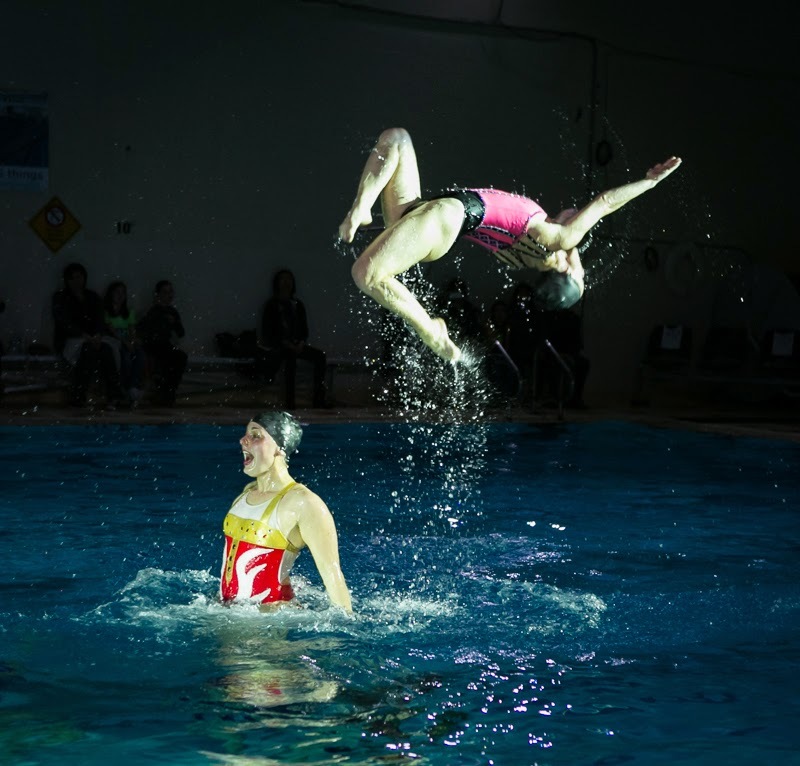 The show highlights how much fun synchro can be, and it can really inspire younger kids. Synchronized swimming - a unique and beautiful sport. 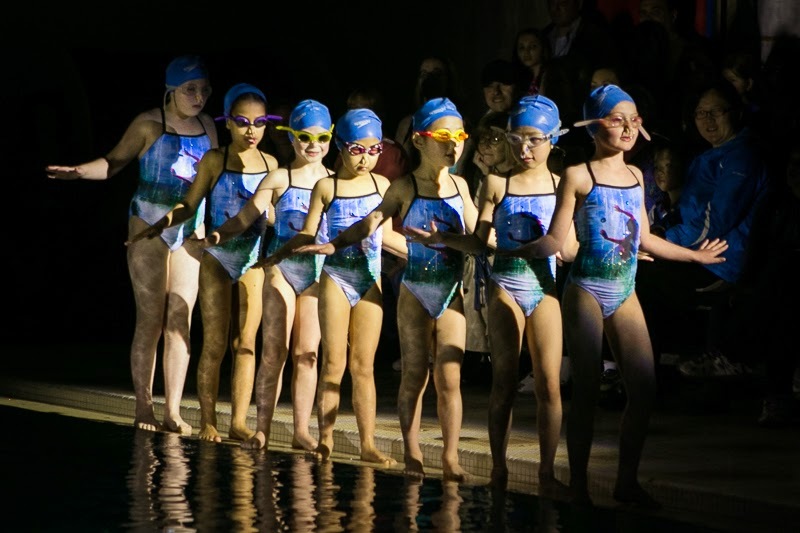 Zsuzsa Belhazy-Kovacs, Veteran Coach of ANA Synchro: Our show is a cohesive piece of work that brings everyone – parents, athletes and coaches – together, with significant help from the Y, to run our biggest community event and fundraiser of the year. It allows everyone to participate and shine, regardless of their skill level, and be a part of a larger, integrated whole. The athletes display not only excellence in the water, but sportsmanship, kindness, cohesive action, and lots and lots of fun. All of this shines through every single performance, creates a very positive vibe, and attracts new athletes and their parents to our unique and beautiful sport. A final dramatic solo swim for this graduating senior! Gloria McNamara, Captain and Graduating Senior: As a swimmer, the show means a lot to me. It's an opportunity for our friends and family to support the team and experience synchro as a performing art! I don't think the audience realizes how much work goes on behind the scenes, but it's an amazing experience working with the entire team at once. I especially love seeing all the younger girls swimming next to the older girls. It does get stressful at times, but I think that the team, as a whole, really bonds through the experience. The ANA Synchro show is an awesome team and community event! Join us next year for the 38th annual show! Readers….how about you? What benefits do you see for the athletes? 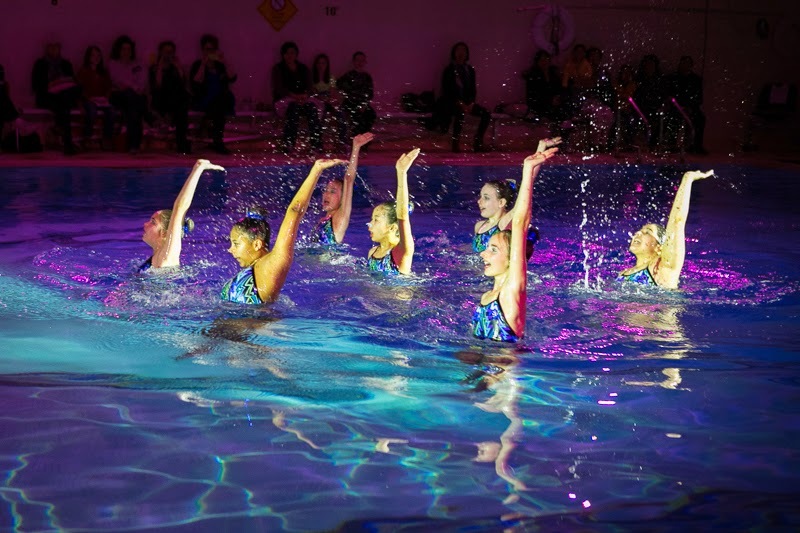 Have you ever been part of a major production like the ANA Synchro Show? What benefits do you see for the athletes? For the volunteers? Let’s hear your stories in the comments section! ← Social Responsibility – What is it? And why be concerned about it?